When I last reported on Bernhard Mairinger, he was still cooking up a storm at BierBeisl, his acclaimed Austrian eatery that he opened back in February 2012. 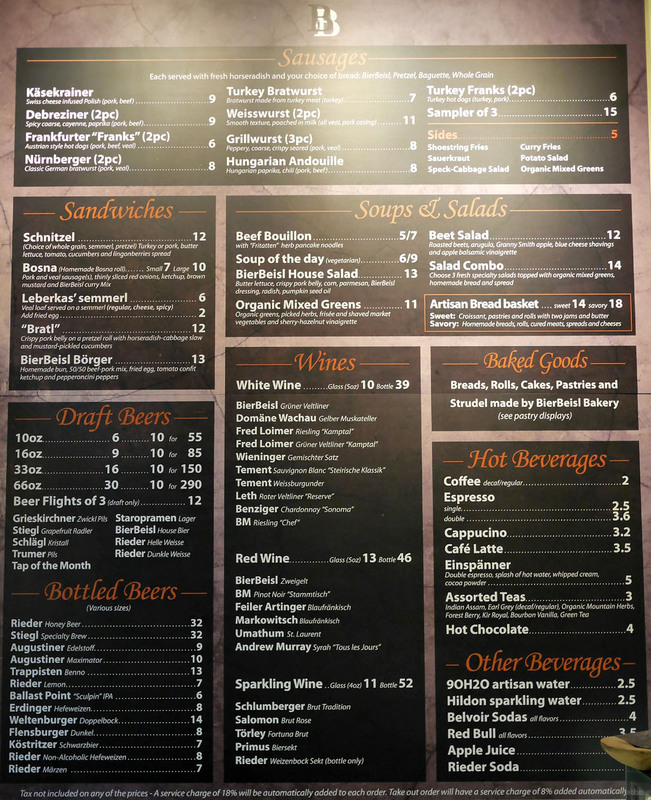 Given how well that restaurant was received, the Chef decided to close up shop in November 2013 to focus on building a bigger version of BierBeisl, as well as a more casual concept, which we see here. 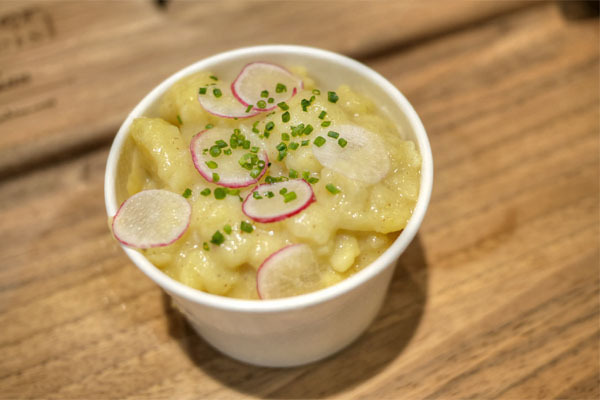 Since the shutter, Mairinger's been back to Austria for research and recruitment purposes and has also cooked two pop-ups: the first in April 2014 at MessHall, and the second in September last year at Si Laa Thai. 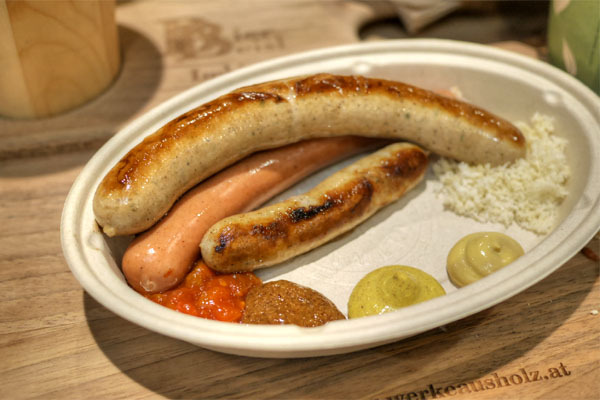 BierBeisl Imbiss (imbiss roughly translates to "snack," and refers to casual take-out joints found in Austria), meanwhile, dropped at the start of July after being pushed back a few months due to construction issues. 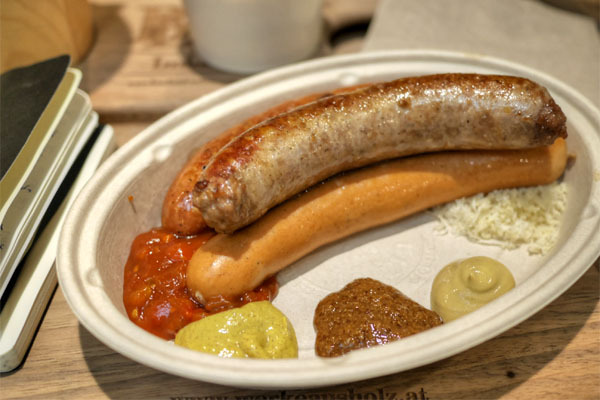 It's located in Downtown's burgeoning Spring Arcade Building, and serves up the Chef's version of updated, street food-inspired Austrian cooking. Inside, things have a sort of Old World charm to them, with plenty of wood (some of it reclaimed, natch) and arches across the ceiling. There's also seating outside in the form of a long, skinny wood counter. Total capacity is 55. BierBeisl Imbiss is an all-day affair, though we were clearly here for their dinnertime offerings. 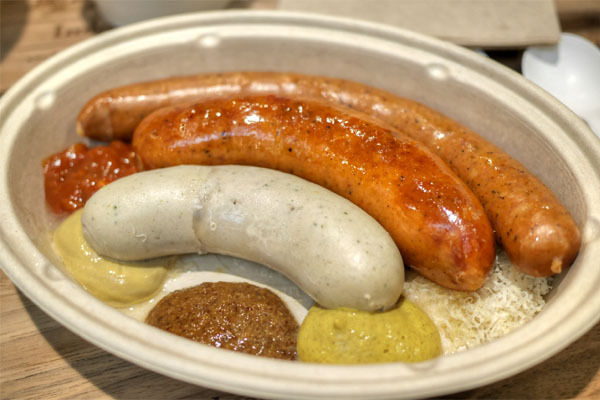 Sausages--commissioned from Glendale's Continental Gourmet Sausage--are the star, unsurprisingly, but they're joined by sandwiches, sides, soups, salads, and a wide array of baked goods. 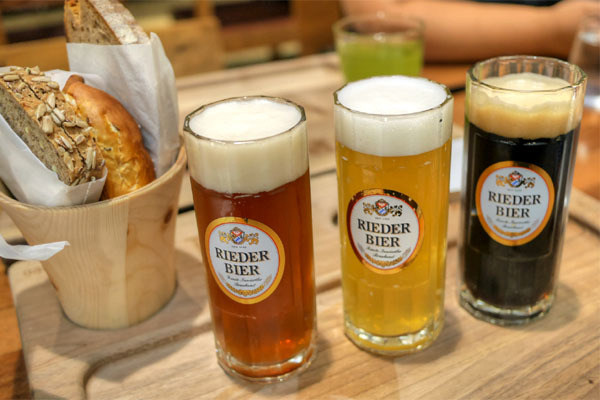 To drink, Germanic beer (including Mairinger's own house brew) is the focus here, available from 10 taps and also by the bottle, and if that's not your jam, there's also a reasonably-priced wine list featuring all Austrian selections. Click for a larger version. Curiously, we were provided poker chips upon arrival, which you receive after purchasing draft beer. Turn the chips over at the bar area to get your pour. Using this method, it's possible to purchase beer at a bulk discount and save the chips for use later. Rieder Dunkle Weisse [$6]: Sweet and fruit and yeasty on the nose; the taste follows, with a pleasant malty, banana-esque character at the forefront. Rieder Helle Weisse [$6]: Weak spicy aroma; more tanginess and spice on the palate intertwined with light citrus and wheat. BierBeisl House Bier [$6]: A special dark lager; sweet and roasty, with a nice malt-forward, dark fruit quality. We made it a point to sample all the sausages, and wound up getting three of Imbiss' $15 samplers, which come with horseradish, ketchup, a trio of mustards, and bread. 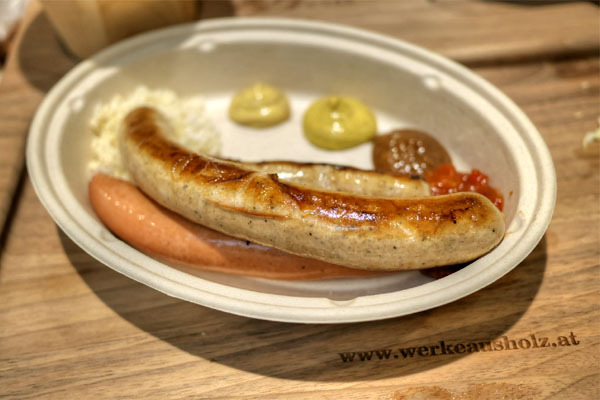 First up was the Käsekrainer, arguably my favorite sausage of the night, combining meat and cheese into one snappy, immensely savory, satisfying package with a lingering finish of Emmental. Of course, the turkey brat wasn't nearly as decadent, but was still delicious, with a great herby quality to it that paired well with the subtle character of the bird. Last up was a turkey hot dog: snappy, fine-grained, classic in essence. 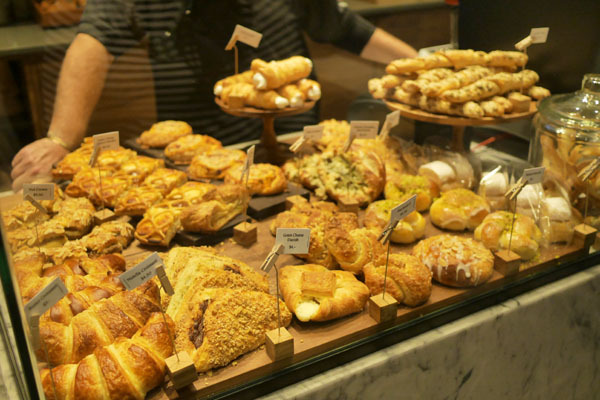 Next door to Imbiss, Mairinger has a full-scale, wholesale bakery supplying breads and pastries, helmed by two bakers straight from Austria: Rene Felbermayer and Michael Hanl. 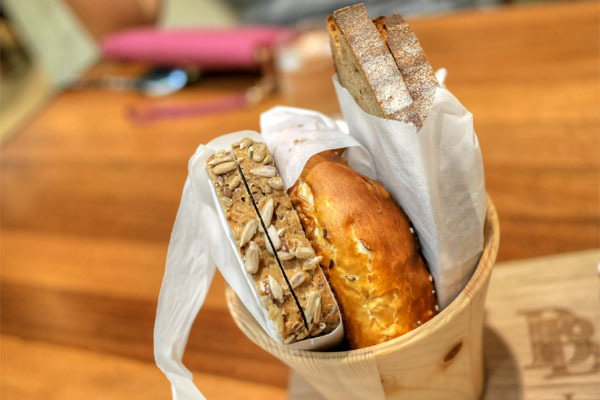 Three of their creations came with our first order of sausage: a delightfully sweet, nutty Apple Spelt with flax and caraway; a prototypical Pretzel; and the signature, warmly-spiced BierBeisl bread made with Grist & Toll rye flour, pork lard, caraway, and coriander. 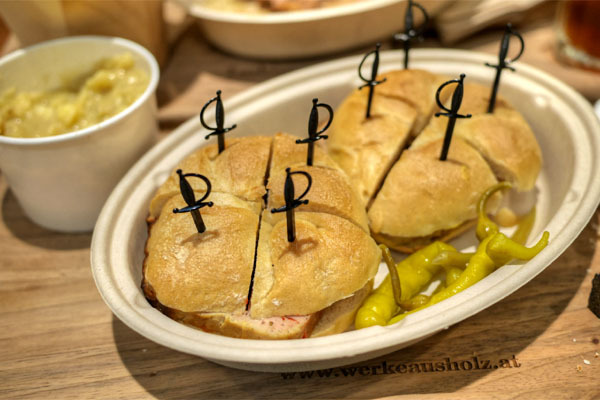 The Chef then sent out three varieties of leberkäse, or veal loaf, served on semmel (Vienna roll). 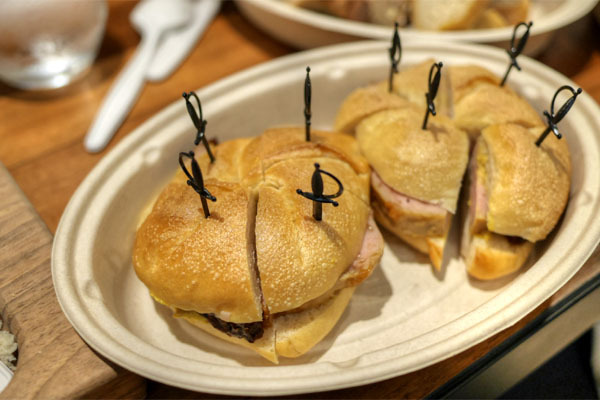 I found the veal supple, almost bologna-like, with a delicate savor that made total sense alongside its traditional accoutrement of mustard. 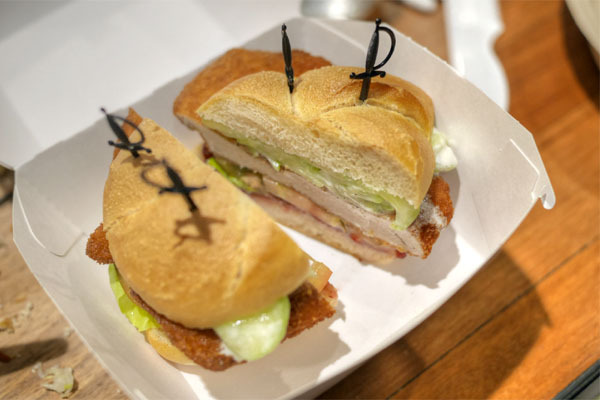 A snacky little sandwich, with nice peppers on the side, too. Potato salad arrived warm and creamy, with a vinegar-y tang to it. The schnitzel was pretty prototypical at its core, a satisfying escalope of turkey that paired surprisingly well with the sweetness of lingonberry while the veggies gave things a crunchy balance. 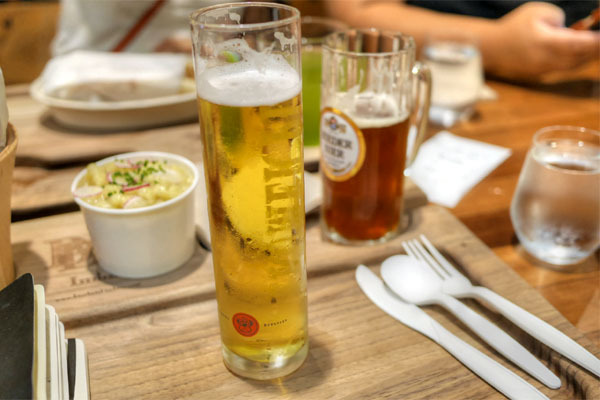 On the lighter side, we also had the Trumer Pils [$6], an expectedly crisp, fizzy, refreshing beer with a subtle bitterness and grain. Time for more sausage. Up first was the Debreziner, the most subtle of the bunch with a light savor and seasoning to it. On the other hand, the andouille was much more in-your-face, with boatloads of savory spice in a snappy wrapper. 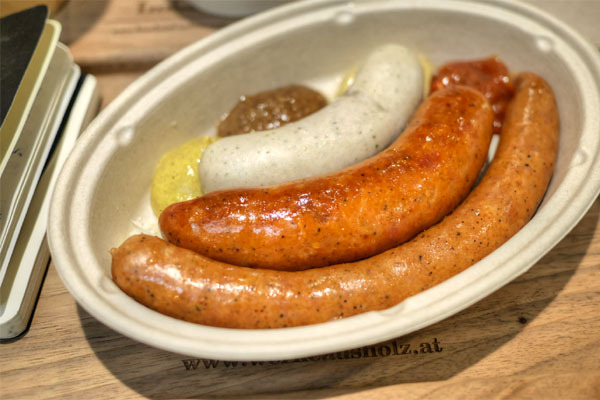 Finally, the Weisswurst was the most refined, the most elegant of the group, soft in consistency, with a delicate herb quality. 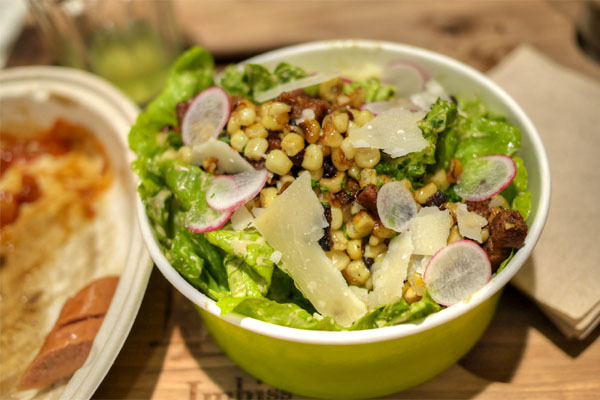 The house salad was surprisingly satisfying, the velvety lettuce serving as a fitting base to the crunchy, salty bits of pork and weight of the Parm. 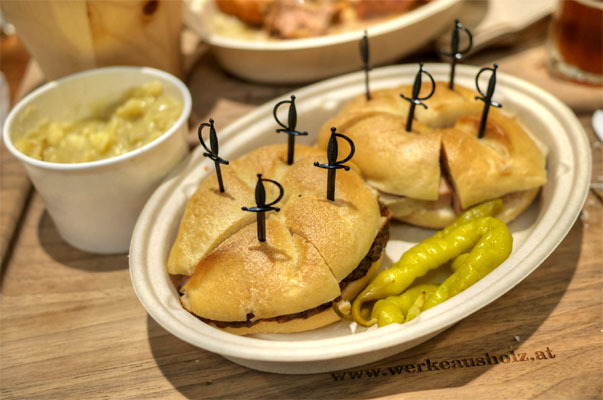 The second incarnation of the Leberkäsesemmel was our favorite, with a lovely spicing to it that really highlighted the delicate nature of the veal. 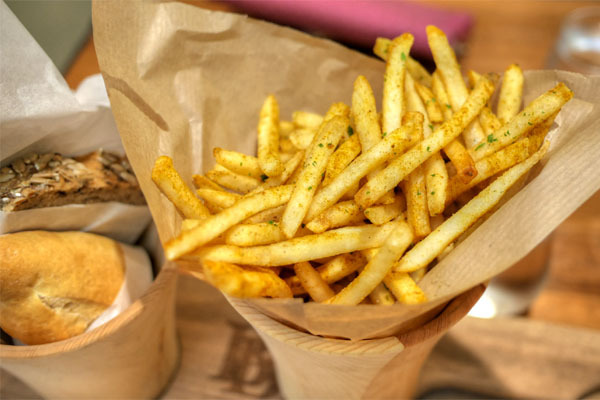 Fries were perfectly textured, with an apparent, but not overwhelming curry presence. Here we had the street food staple of Bosna, comprising a snappy pork-veal sausage spiced with curry, turmeric, and garlic. I was afraid that the curry would be over-the-top, but it actually made great sense here, especially when taken with the combo of ketchup and mustard, the onions adding an astringency to the mix. 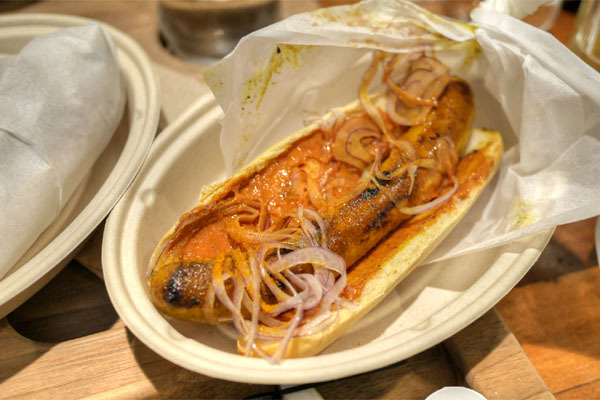 The last of the sausages started with a brat, a pretty O.G. presentation with a surprisingly refined herbiness to it that I quite enjoyed. Next was the traditional frank, a smooth, fine-textured example with a classic flavor profile. 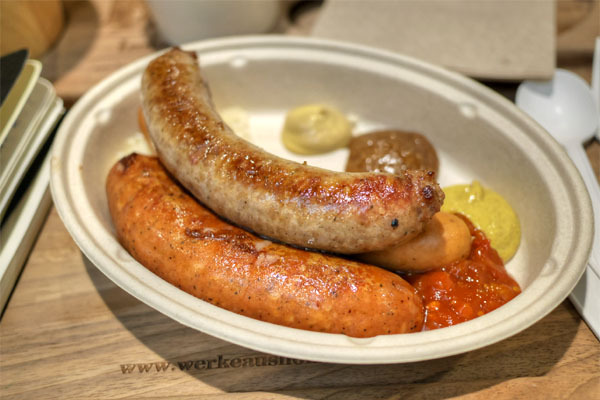 The grillwurst, meanwhile, was almost breakfast-y in nature, and one of my favorites with its somewhat gritty consistency and savory, peppery flair. 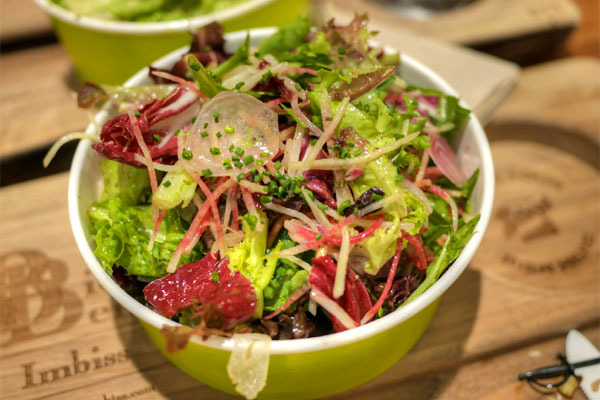 Mixed greens were nice enough, light and bright and crunchy, with the nutty, tangy vinaigrette tying it all together. The last veal loaf featured the incorporation of Emmental, which provided a much-appreciated cheesiness to the whole experience. 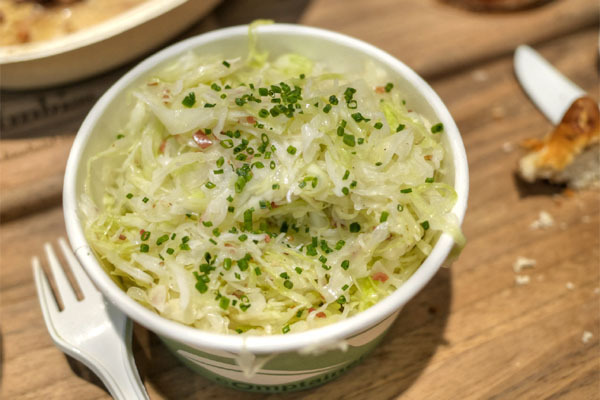 Cabbage salad made for a fitting alternative to your ubiquitous sauerkraut, with the depth of the ham giving a boost to the greens. 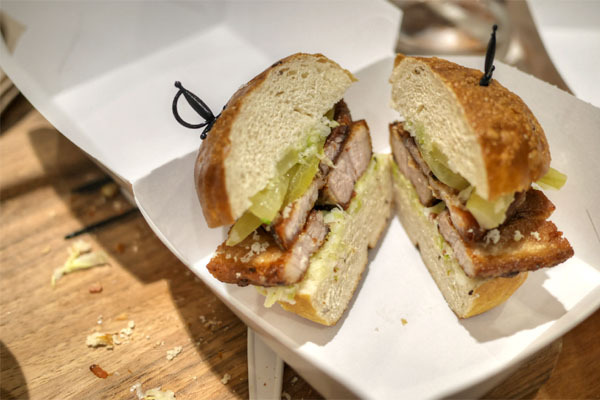 The so-called "Bratl" was another favorite of mine, the delightfully crisp, savory belly perfectly countered by the tangy slaw and tart pickles. 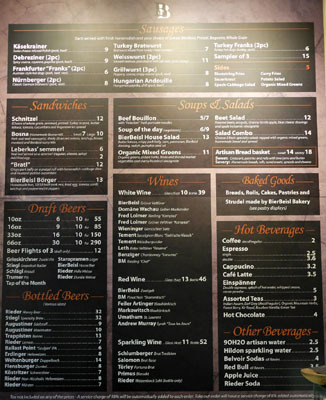 I don't think BierBeisl has a formal dessert menu. 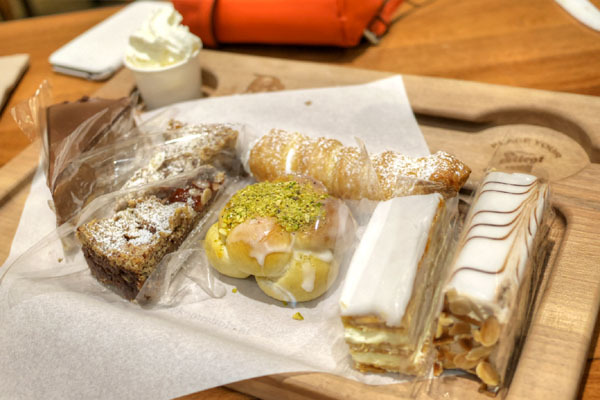 Instead, diners are free to browse the restaurant's considerable selection of baked goods, including various tarts, cakes, and sweet rolls. We opted for this combination: banana Schnitten with its delicious mix of chocolate and banana flavors (my favorite); two nutty, crumbly Linzertorten; a superb Mozart bun with marzipan; a flaky, creamy Schaumrolle; a delightful Esterházy torte; and one more item that I was unfamiliar with. We definitely enjoyed ourselves at Imbiss, with its cozy, comforting, classic cooking elevated with just enough of a cheffy bent. 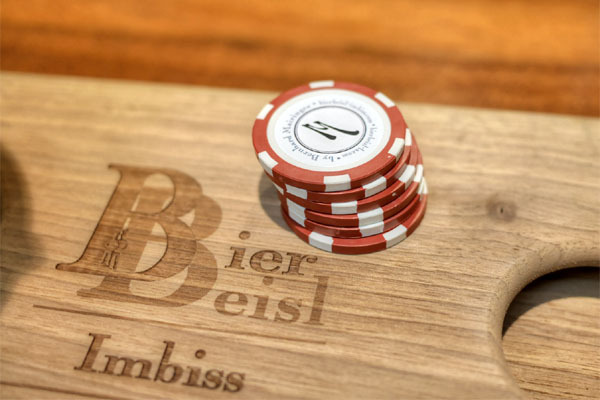 It all makes me even more excited about the return of BierBeisl proper, Mairinger's larger, fancier restaurant-slash-patisserie-slash-Biergarten that will hopefully debut on the Westside within the next year. I'd go just for that dessert plate.